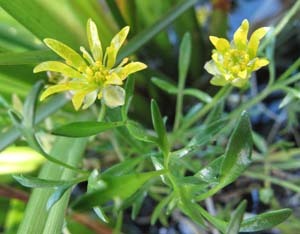 Ranunculus prasinus (Tunbridge Buttercup) is a small, very rare rosette herb. It is only known from 5 lagoons near Tunbridge in the Midlands. The leaves sparsely covered in hairs and are trifoliate, with each leaflet often trilobed. They are grass green and quite thin. It has a single, yellow flower about 10-12 mm wide on a stalk above the leaves. 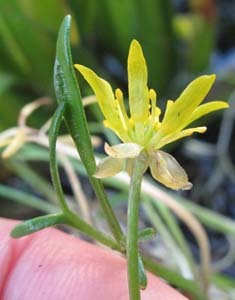 This species is very similar to the widespread aquatic or semi-aquatic species, R. amphitrichus, but the flowers have pale yellow, hairless sepals and leaves are thinner and paler.